Probably one of the more fortunate things about my victory run was that i never had to buy any fuel. Early on in the run i had three “trade missiles/drone parts for fuel” encounters where my fuel skyrocketed into the 30s, and the rate of fuel drop for random encounters was such that i was never in danger of running out of fuel, hardly ever even dropping below 10. I gained Scrap Recovery Arm in the middle of sector 4, and the resultant higher scrap rewards made it easy for me to put my engines at a high enough level after maxing out shields and having most other basics in place that my hull health only fell below 40-50% twice. I think i only bought my hull health back to 75% one of those two times – the rest of my hull recovery came from random encounters. I ended up getting my Drone System sometime in sector 5, and at that point when i could afford it, the shop i came across had it for sale with a System Repair Drone but also had a Defense I for sale in the same shop. I had passed Drone upgrades before, but at this point i decided that it was too risky for me to pass this up even though it wasn’t the most ideal because i wasn’t sure what my chances of seeing a Drone System was in the future. I think i was able to get both by selling a drone part and a weapon i had picked up in random encounters. I never saw a Defense II for sale for the rest of the run. My three weapons where my original Adv. Flak, and then Ion Blast II and Chain Burst Laser, both of which i picked up in random encounters. I ended up selling back a few missile and bomb weapons, as well as a Heavy Laser II. This ended up making weapon management super easy – advanced players of FTL understand that using Auto-Fire is generally a horrible way to deal with weapons because you need to have more concrete control over simultaneous weapon attack timing. This is even more important when employing a boarding strategy like I was because i generally only ever wanted to use my weapons to destroy key systems but nothing more. But Ion Blast II is something that can always go on auto-fire because its fire rate is so quick and its purpose is not hindered by the need for coordination between weapons – just auto-target that puppy on shields and let it do its magic. Then i could do single shots with the Adv. Flak and Chain Burst Laser and easily take out necessary systems without having to coordinate too carefully. Before i got the Chain Burst (which i got last), i would autofire Ion Blast II at the shields, and then have the Adv. Flak cripple weapons first, annoying drones if applicable second, and then med bay/clone bay third, all of which i managed manually. When i got the chain burst laser (which happened somewhere around sector 6-7), i switched my Adv. Flak to shields along with the Ion Blast II and pointed the chain laser towards the weapons system. This is where i started to finally use Auto Fire even when i was boarding, and just made sure that i monitored the enemy’s ship health so i wouldn’t lose my Lanius aboard the enemy ship – which was still not a huge deal because if they died on the ship they would come back in the clone bay anyway. I hit a point in the late sector 7 where i was able to upgrade all of my systems to at least one level higher than i needed to function, which also says something about the fortunate aspects of this run since that’s the first time i’ve ever been able to do that – I’ve had runs where i can’t even get my shields upgraded to full strength by the time i reach the Last Stand, but this time, circumstances worked out that i actually had a fairly well beefed ship by the time i had to fight the Rebel Flagship. This also made me choose at some point to not always teleport my Lanius aboard enemy ships, particularly if they had a medbay or clone bay on board, as i didn’t need the extra potential scrap and i had enough weapon power to kill off ships with minimal damage to myself. I remember when this happened for the first time and i was completely confused – my Laniuses were in a 4-panel med bay and i had mind-controlled one of the enemy to try to help me deal with the enemy crew. i quickly learned that the med bay was higher than level 1, and there were too many enemy crew for me to handle without dying. As soon as i was able, i teleported back to my ship – and the mind-controlled enemy came with me. In the seconds that the mind-controlled enemy was still under my control, it traveled through my ship to find a system to man and help out as one of my crew – i didn’t have any control over it. Then the mind control stopped, and i had an enemy crewmember on board my ship in a context where the enemy ship had no teleporter at all – and thus couldn’t teleport back. Go to the oxygen room (in my Lanius ship) and just stand there. So as long as i had crew manning all controllable systems and had no damaged rooms, the mind-controlled crew would teleport to my ship and then take the long journey to my oxygen room. I also discovered that mind-controlled enemy can go through room-hacked doorways as if they weren’t hacked at all. So i started practicing a battle tactic where i would do that – mind control and return teleport an enemy crewmember, wait for him to become normal again, and then i’d open up the doors to the oxygen room and the room next to it to deprive it of oxygen so that the enemy crew would asphyxiate. Here’s an example battle where I put this into action. The Mind Control exploit was key to me defeating the Rebel Flagship, in combination with the fortunate run that gave me a pretty well-beefed up ship. Stage 1: To start the battle, I aimed the Ion Blast II and the Adv. Flak on the shield room and aimed the Chain Burst Laser on the missile room. I also clearly activated my Defense I. I teleported my Lanius crew into the Ion room and quickly killed the crew member in there and then the actual weapon. The Rebel Flagship, meanwhile, had opted to hack my Backup Battery, which not only took it out of commission but took away two of my reactor bars when activated. I turned off my clone bay, maximized my engines minus one, turned on my system repair drone, repositioned one of my Lanius Crew on the other side of the Battery Backup so it could help with any repairs since i wasn’t going to use it to teleport anymore, and then started to go through the Mind Control Exploit one crew member at a time. Having the high engines helped – my Defense I would hit the first missile, and out of any remaining volleys I only got hit maybe 8-10 times. Because i had bought levels 1 higher than what i was using, none of my systems were ever truly crippled, and i repaired the damage as quickly as i could. The process was long – my constant firepower dwindled the Rebel Flagship slowly but surely, and in the meantime i was able to teleport out and then kill all but four of the crew which including the one isolated in the Beam Weapon room. The first boss stage was at the Federation Base itself, and right next to that was a Repair station – another fortunate random circumstance. I jumped to that spot to repair, and then jumped back to base to deal with Stage 2. Stage 2: For some reason, one of the enemy crew from Stage 1 to Stage 2 disappeared. Either that, or I remember incorrectly how many crew i had left on the ship before i killed it. To start the battle, i did the same weapon configuration, but i reconfigured my crew – i moved my Rock and Mantis to the teleporter and moved my Lanius to random positions. The main reason i did this was because i wanted to have the Lanius crew deal with the boarding drones because they wouldn’t lose health from the oxygen-deprived room that the boarding drone would create. I mind-control exploited the remaining enemy crew. This was a little more complicated because there was so much havoc going on that the enemy crew didn’t default to the oxygen room, but since there were only two of them (the third was still isolated in the Beam room), it didn’t take too long. As soon as the main part of the Rebel Flagship was clear, i teleported my Rock and Mantis crew aboard and killed the missile weapon room, then shifted all of my firepower to the shields. With no crew present to repair anything, i took it down fairly easily, losing about the same overall hull damage as a result of the drone volleys and initial missile volleys. Stage 3: Since the remaining crew member had been in the Beam Room which was now cut off from the ship, there was actually no crew left on the ship at all, so the automated weapons system kicked into gear. It didn’t matter. As soon as the Zoltan shield was down, i teleported the Rock and Mantis crew aboard the ship to take down the missile weapon. I used my mind-control to counter the Rebel Flagship’s attempt to mind-control me before getting annoyed enough about having to do that that i moved my Rock crewmember to that room to kill that system as opposed to where he was which was in the shield room. Since the automated system could repair its systems on its own, I left the Mantis in the missile room and the Rock in the Mind Control room until the ship was killed. They lived a good life, and their clones were going to come back and take credit for the victory anyway. My Victory Score was actually not my best score – i have another run where i got 5356 points. I think i died on the second boss stage and got a higher score because my scrap amount was absurd? I don’t quite remember. That’s basically it. 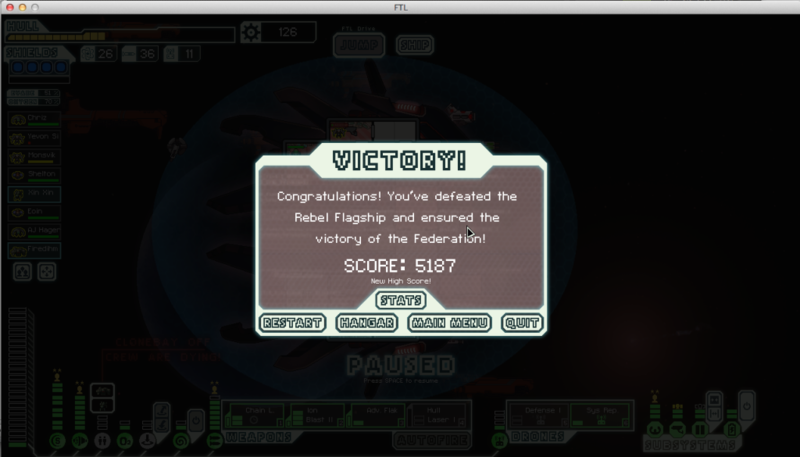 First and only victory on Hard Mode. And i can stop playing this damned game now. Not that i was obsessed or anything.